How many of you are ignoring Apex Legends and are still inside the Wild West world of Red Dead Online? This news is for you. Firstly player blips on the map will not display for anyone over 150 meters away, a minor change sure, but anyone over 150 meters away will give away their position if they fire their weapon. Players in other regions and towns will not be visible. Additionally to this, anyone who plays in a overtly hostile way will have their map position become more visible to the other players, with a dot that colour shifts from blue to dark red as they rack up bad deeds during play. The faster you commit bad deeds the quicker your dot will change and become more visible to others. The only way to get it to go back is to stop being naughty. Another way the game is changing socially is through Posse-wide Parleys and Feuds. 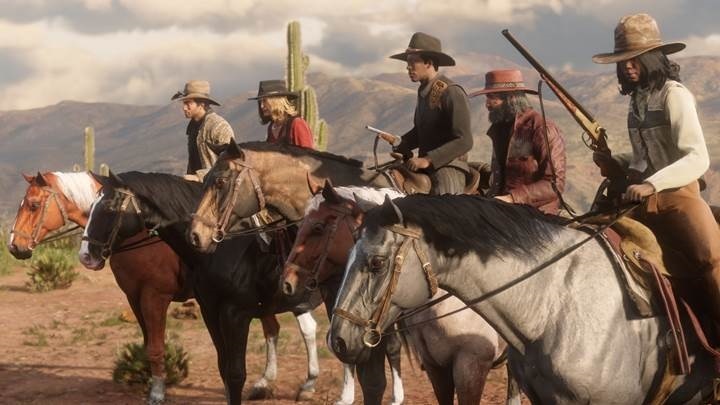 You can initiate a Parley that will apply to the Posse of your attacker after one kill, or if you’d rather meet violence with violence you can initiate a Feud, Posse Feud or Leader Feud, giving you an impormptu deathmatch. Being a bad person in the west will see a bounty placed on your head, if your bounty gets big enough you may find yourself targeted by NPC bounty hunters. Depending on the severity of your crimes the bounty on your head will increase and once it increases to a certain point the bounty hunters will be loosed and you’ll be alerted to their pursuit. The higher your bounty the more difficult you and your posse will find it to escape. Players will be able to undertake daily challenges that will offer XP boosts and gold nuggets for completing objectives. These will range from foraging for herbs, hunting, skinning and clearing hideouts. There’ll be a whole load to undertake with more to come in future updates. Other than that there’ll be the usual bug fixes, and balancing tweaks, you know, the boring stuff barely anyone pays attention to. While you wait for all this to go live you’ll be able to earn more XP by playing in a Posse during free roam missions and evenets. Doing this will earn you twice as much XP, with next week offering 20% more XP across all Red Dead Online Beta activities.